The Crown-of-Thorns Starfish is a large starfish that can grow to more than 1m in diameter. It is named from the long, sharp, venomous spines that cover its entire dorsal surface. It can have between 7 and 23 arms that radiate from a large central disk. it is usually brightly colored and highly visible from above. The Crown-of-Thorns starfish is a notorious hunter of coral polyps, particularly those of reef building corals. It feeds by a method known as eversion in which stomach is forced through the mouth and wrapped around the coral, secreting digestive enzymes and absorbing the digested tissues. 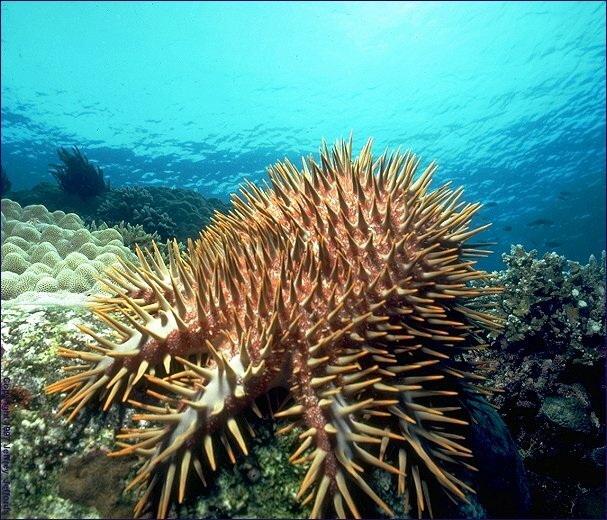 Population booms of Crown-of-Thorns Starfish can have devastating effects on coral reefs. Reproduction occurs sexually and typically occurs between December and April. The Crown-of-Thorns starfish is found throughout the Indian and Pacific Oceans inhabiting coral reefs composed mainly of stony corals. The Crown-of-Thorns Starfish is one of the contributing factors to the recent destruction of the Earth's coral reefs. Humans are thought to be part of the blame due to the fact that we are over-fishing the natural enemies of the Crown-of-Thorns Starfish; accounting for their recent population booms. "Crown of thorns starfish". Arkive.org. Retrieved from: http://www.arkive.org/crown-of-thorns-starfish/acanthaster-planci/.